When we’re not renovating the house or working in the garden we really enjoy pretending we’re historians. Since moving to Westview in early 2007 we’ve spent countless hours digging through old files at the Atlanta History Center, searching newspaper databases and microfiche, emailing with old residents of the neighborhood and examining deeds and plat maps at the Fulton County Courthouse. It’s like piecing together a really exciting puzzle! At this point it is difficult to even say where our search began. I honestly can’t remember. It is quite possible it began with this blog. In the early days we had a regular reader (Marsha, hopefully you’re still reading!) contact us about her time spent in the neighborhood as a child. Steffi and Marsha exchanged emails for a while before losing touch. Or perhaps it started when we made our first visit to the Atlanta History Center’s Kenan Research Center and found a map dating back to the 1890s that showed our street. No matter, it has been an interesting journey that has taken us down some dark paths – including murder – and some very bright paths – including a rock n’ roll star that lived on our street during the 1950s. It saddens me to also say we’ve lost some people along the way. People that were very generous sharing their memories and photographs with perfect strangers. I’ll give you a brief overview of the history and some of the highlights that stand out to me. We’ve written a great deal about it on the Westview website, so you can hop over there after you finish reading the blog if you’d like to know more. In 1884 land was set aside for the Westview Cemetery. This was the second cemetery built in Atlanta after Oakland, and even today Westview Cemetery remains the largest cemetery in the Southeastern United States. The cemetery is important to the neighborhood because a street car was built to transport people from downtown to the cemetery. The original street car was pulled by a mule and of course later went on to use electricity. The gate to the Westview Cemetery is an awesome stone structure that was featured on postcards. We have a framed postcard on our wall that one of our neighbors (a real life historian) gave to us. Needless to say the entrance still stands, so if you’re in the area you should go check it out. Lots of famous Atlantans are also buried there. 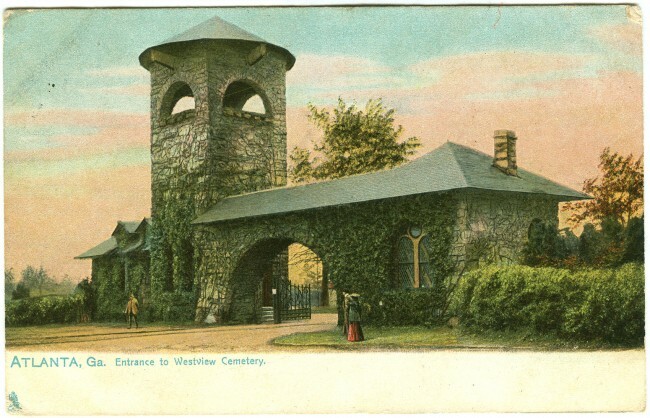 Westview Cemetery Postcard – It is postmarked July 1909. The Westwood Park plat map that shows the original planned streets. Here’s where one of the dark twists comes in to play. 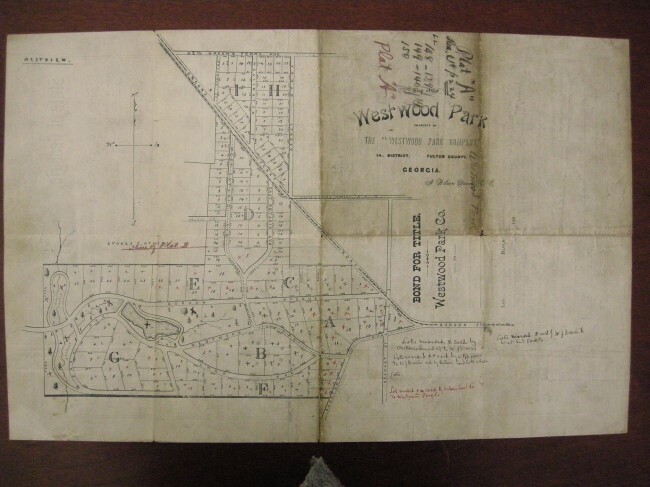 The Westwood Park property sat vacant for a number of years before it was re-subdivided. During this time a highly publicized murder took place. A man from Roswell named Forrest Crowley was lured to the site on the promise of buying some mules. When he arrived he was murdered and robbed. The murder took place by the lake, which can be seen in the plat map above. There is no lake in the neighborhood today. 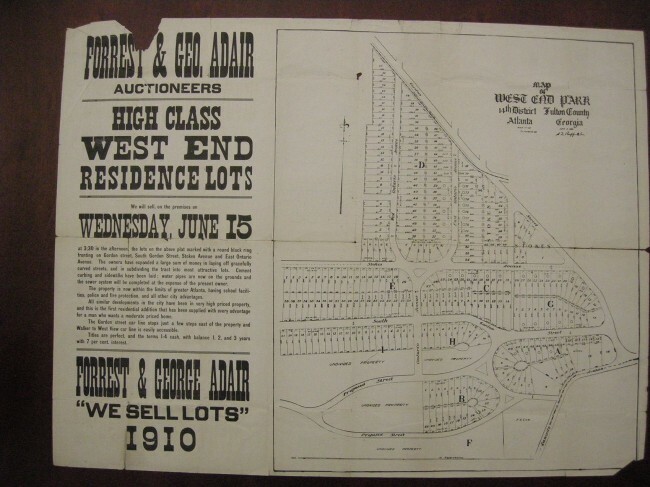 Murders aside, in 1910 a man named William J. Davis purchased the land for $100,000 and announced it would be called “West End Park.” The land was subdivided and lots were sold by Forrest and George Adair at auction over the next few years. Our lot was sold at the very first auction in June, 1910 for $750. Our house wasn’t built until the end of 1916. The original owners were two women that owned their own multigraphing (copy) shop. Their mother also lived with them. Neither of the women had children as far as we know, so we’ve had difficulty locating any of their living relatives. If anybody reading this is related to Cora and Lucy Thomas please contact us! Their mother was named Frances Thomas. We’d love to hear from you! This is not our house, but it is a house from one street over. We found this photo at the Atlanta History Center. From there the neighborhood chugged along as a popular residential district. Lots were sold, the neighborhood was expanded, streets were paved, a school was built. 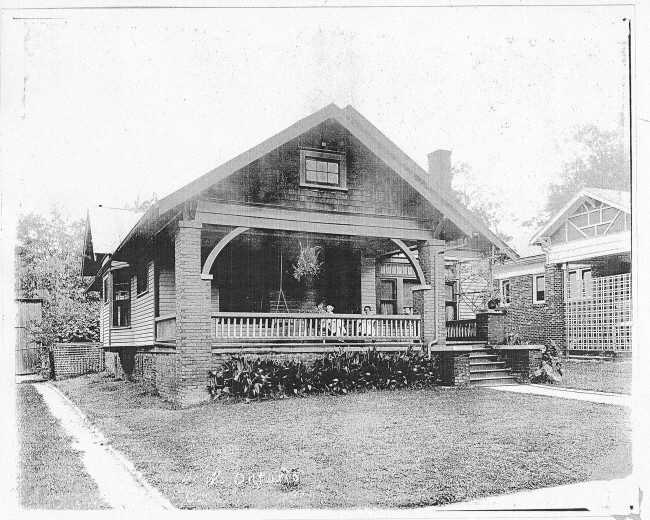 In 1927 a real estate/home building company focused heavily on building and selling homes along Stokes Ave. The company, F.P. and George J. Morris, even opened a real estate office near the corner of South Gordon St and Cascade Ave. The storefront is still there today (but of course it serves a different use). The Great Depression seems to have temporarily halted the overall development of the neighborhood, and we’ve had people verbally tell us some homes were split up into duplexes during this time. However we found a single newspaper article from 1931 that shows that houses continued to be built and sold – though the pace must have been dramatically reduced. The WWII housing shortage saw a number of smaller homes built in the community. This rapid construction was intended to be 2/3rds rentals and was controversial with the existing homeowners. Mayor Hartsfield even got involved to try and diffuse the situation. The 1950s saw the rise of rock n’ roll and our neighborhood was no exception. Tommy Roe, who was getting lots of practice playing gigs around town and at Brown High School, lived just down the street from our house. During a tour in England with Chris Montez a new group called The Beatles was billed as one of the opening acts. And when The Beatles played their first gig in the U.S. one of their opening acts was Tommy! How cool is that?! In case you’re unsure of who Tommy Roe is here is a couple of his videos. I’m sure you’ll immediately recognize these songs. Fast forward a few years to the 1970s when Mayor Maynard Jackson, Atlanta’s first African-American mayor, lived in the neighborhood. The family that currently owns his former home still occasionally receives junk mail addressed to him. We have also been told his bodyguards lived across the street in order to offer 24-hour protection. And I’m starting to realize my brief overview about the history of the neighborhood has become quite long, so I’ll wrap it up there. The research into the history is an ongoing project and new artifacts from the past continue to come to light. It’s really been quite an exciting journey for the small group of homes in southwest Atlanta. As people always say… if only these walls talk!